My wife and I went grocery shopping for a family of four last night, in a chain supermarket in Eastern Caracas. There were fruits and vegetables of all kinds. There was also plenty of: cheese, yogurt, lunchmeat, sausages, bacon, pasta, bread, crackers, cookies, nuts, wine, beer and soy oil. From the meat cooler we got a nice pork loin and some smoked pork chops. We passed on the turkey drumsticks. The “fresh” fish all looked like it was from distant times or places; so we passed on it too. Not available were: chicken, beef, milk, coffee, rice, sugar, corn oil, laundry soap, dish soap, paper towels and toilet paper. Fortunately we have all but the first two in stock at home (getting low on coffee and paper towels though). We’ll keep an eye out for beef and chicken. The item that raised the most curiosity among shoppers was the “multi-purpose, liquid soap.” This had a constant group of people around it speculating what it could be used for. Dishes? Laundry? Bathroom? The point here is that “empty shelves” is not quite the right image of what the Venezuelan consumer faces. Rather, the problem is two fold: scarcities of basic goods and inflation. And the latter is worse than the former. One Venezuelan market researcher recently told me that their data collection was showing much lower levels of scarcity in homes than in stores. So for example, while in stores 40% of basic goods might be absent, in an average home it might only be 10%. This is because people obtain scarce goods by doing the “supermarket tour” (i.e. visiting several supermarkets per week) or by buying basic goods in the informal economy (i.e. black market) for three or four times their controlled price. They also stockpile goods, buying large quantities when they are available, in anticipation of future scarcities. But the more disturbing problem is inflation. 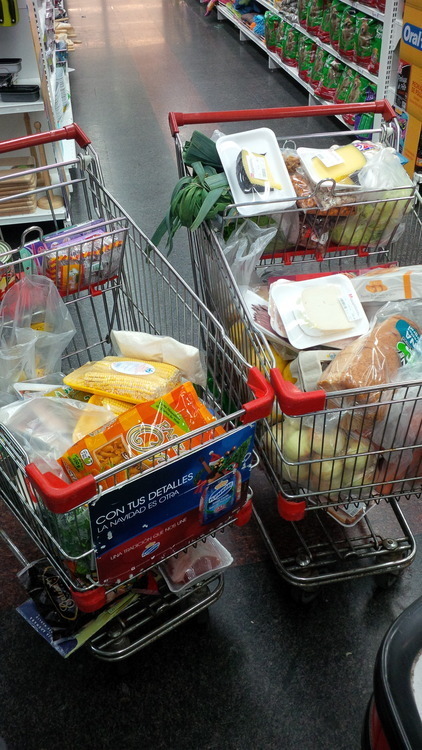 Overall the bill for these two full shopping carts (which will last us about ten days), missing several staples, came to about four months of Venezuela’s minimum wage. Getting rid of some luxury goods (like Dutch goat cheese, smoked swordfish and a bottle of booze) it would probably be about three months of minimum wage. In contemporary Venezuela you can get a good variety of food if you have enough money, either by purchasing non-standard goods whose prices are not controlled, or by purchasing basic goods on the black market. But if you are poor, you are highly dependent on purchasing basic goods at their controlled prices. Obtaining them, if they are available at all, requires waiting in lines during multiple supermarket visits per week: today chicken, tomorrow laundry soap, the next day milk. From 2007-2012, consistent scarcity levels of around 10-20% coincided with a historic increase in calorie and protein consumption. We do not have the data on 2013-14 yet but it seems likely that when we do, we will see a reverse in these trends.